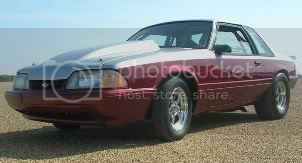 Like the title says I just bought a 93 gt and am looking for all kinds of parts. Car is now running. Stock to performance parts. My wife finally let me buy another fox body and I'm looking to go all out with it. And as the old saying goes what my wife doesn't know won't hurt me lol. Looks aren't that important because it's going out for paint in a few weeks but performance is key. It has a junk yard 5.0HO with a T-5 in it which what I believe is an B303 cam. Exhaust is already covered but I'm looking to upgrade as much as possible over a period of time that is so wife doesn't know how much money goes in to car. Moved your post to the 79 to 93 section since you are planning to stick with a pushrod engine setup. If you were going coyote swap it could be in that other section. How fast do you want to go, how much you have to spend, and do you want it streetable and reliable? Fox bodies have been around forever and I've been through many combinations starting bone stock auto running 15.70 to stroked 427 running 10.30s on motor, to a stroked dart block setup with a powerglide running 9.50s on motor and 5.40s in the 1/8 on nitrous. It's hard to go wrong with turbo setups these days.